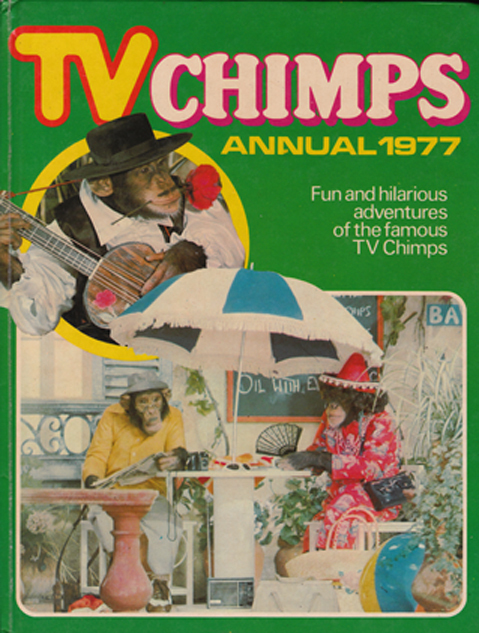 Description: Now here's a real rarity: an annual devoted to the chimps made famous by the ads for PG Tips. Contains 10 stories illustrated in full colour, a whole ton of jokes and rhymes presented in comic strip format, plus numerous puzzles, quizzes, and a crossword – all of which have been completed in pencil, except for the crossword which has been solved in red ball-point pen. Both covers are in excellent order with only very minor marks on the front and rear. The spine is bumped and has a small chip at the bottom. The corners have generally resisted bumping, and it is only the top right-hand corner which is bumped. The previous owner has written his name in red ballpoint pen on the title page (which also happens to have been price-clipped and is slightly loose at the bottom). Otherwise the contents are very clean and very bright, with absolutely no foxing or tanning to pages. Despite the one slightly loose page, the binding is very tight. Measures 10.6″ × 8″ (26.5 cm × 20 cm). 4to. 77 pp. (partially paginated).